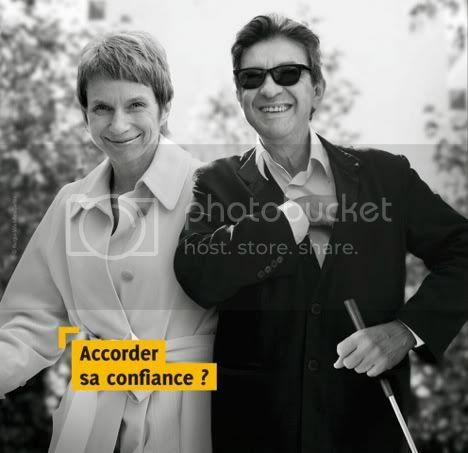 A new campaign from France's leading organisation for the visually-impaired uses well-known politicians being guided by their equally well-known rivals. The images are being published in calendar format by the Federation for blind and visually-impaired of France, known as FAF. 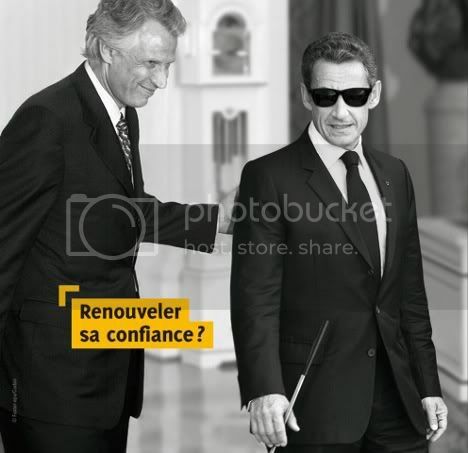 In one image, President Nicolas Sarkozy is shown wearing dark glasses and being helped along by former prime minister and rival Dominique de Villepin. 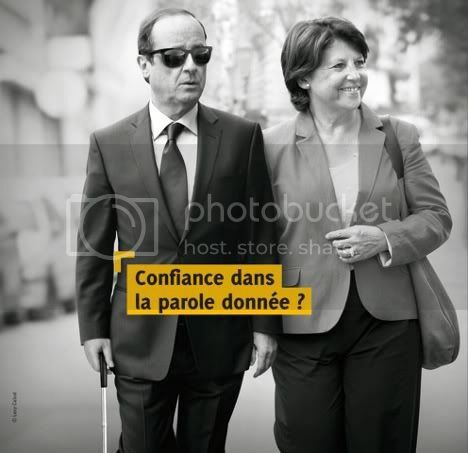 In another, the Socialist party's François Hollande is shown being accompanied by the woman he beat in recent elections to be the party's presidential candidate, general secretary Martine Aubry. A line on the image says "confidence in what you're being told?" Daily newspaper Le Parisien reported on Thursday that the federation is angry at broken promises by politicians over the years. "The blind are people who put the most trust in others," said Vincent Michel, president of the federation. "Yet, given the way we've been treated over recent years, we have the feeling we've been abused." Michel cited a number of initiatives that, he claims, have failed to live up to their promises. These include a plan to make large-print books more widely available. "Today, just 3 percent of publications are adapted to the visually-impaired," he said. There are 80,000 blind people in France and a further 300,000 who are visually-impaired. The FAF brings together 43 different associations and has 10,000 members. The calendar featuring all the images will be available on the federation's website (www.faf.asso.fr).